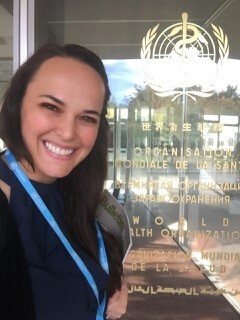 PAU’s doctoral candidate in clinical psychology, Maryke Harrison, was invited to present at World Health Organization. Maryke has worked with underserved populations in South Africa, India and United States, to address HIV/AIDS, leprosy and substance abuse. Maryke also has served extensively in Native American tribes, focusing on suicide prevention through community empowerment. She has helped to develop a wellness workshop for African American older adults in the greater Los Angeles area and led an awareness campaign focused on the prevention of HIV/AIDS. Most recently, Maryke was invited to the World Health Organization meeting in Geneva, Switzerland. She presented about her work for suicide prevention in front of 250 attendees, including representatives from member states. “It was very exciting since all the individuals in attendance were able to hear about the work that we are doing at PAU!” Maryke remarked.